“Sunrise, sunset,” or so the song goes. Time passes, we get older, and another generation takes our place. 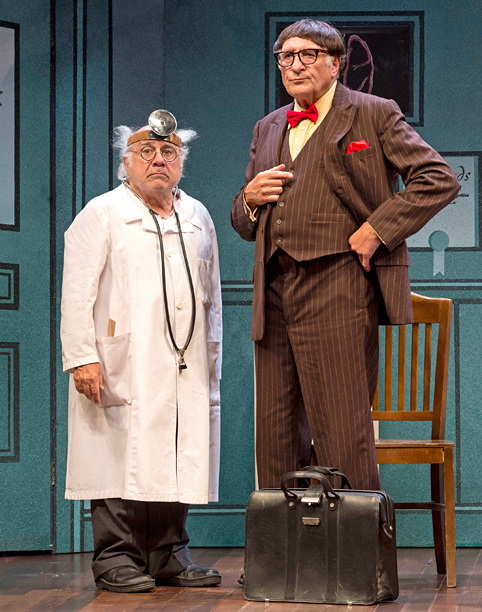 Maybe “The Sunshine Boys” is a little old and tired for yet another sunrise, but soldier on it does in the cavernous Ahmanson Theatre. The loyal army marches in to applaud. Look, the revival in London last year with Danny DeVito playing opposite Richard Griffiths was a big hit. Griffiths died earlier this year and has been replaced by Judd Hirsch, who last worked with DeVito on “Taxi.” The two of them play off each other like the old vaudeville pros they are playing. So what am I complaining about? The story, in essence is about old material. How old? Well, it was written in 1972 and sounds it. It is about a long-running (43 years long-running) vaudeville team, Lewis and Clark, the Sunshine Boys, who are washed up in more ways than one. Eleven years ago Lewis quit the team — vaudeville itself had pretty much quit — to become a stockbroker. It was a bitter parting and they have not spoken since. Clark is permanently holed up in his seedy hotel room, wearing red-striped pajamas, moldering and snapping at any unfortunate who happens to cross the threshold. His sole outside contact is his only relative, the faithful nephew, Justin (Ben Silverman), an agent who tries to get Clark roles, and who makes thankless visits every Wednesday, delivering healthy food — feh — and “Variety.” “I always get chest pains on Wednesdays,” says Justin. “Then come on Tuesdays,” replies Clark. It is not subtle. In addition to insulting everyone, Clark cannot remember his lines, which makes employment an impossibility. Lo and behold, this time Justin has an offer from the Ed Sullivan Show. He can be seen and make some money. If only Clark will be willing to see Lewis again, they can do their famous skit, “The Doctor Will See You Now” on America’s favorite variety show. Are you getting the sense of dated? In 1972, just about everyone knew the Ed Sullivan Show (which had just ended), and most theatergoers were no more than one or two degrees of separation from knowing vaudeville. At the time the setting was not even nostalgic. Now? Now these topics lack immediacy, and the setup itself is not poignant. Played for laughs, more to the point, written for laughs, what we see is a tragedy of two old men. Act I, the laughs are plentiful; by the end of Act II, men in the audience are checking their illuminated watches for the time. Don’t get me wrong. Danny DeVito gives Willy Clark, the old and cantankerous vaudeville star, all he’s got. Padding around the stage in those pajamas, he is the befuddled kvetch par excellence, a nasty Mr. Magoo. Judd Hirsch shows his mettle, wisecracking with the best of them. There are some really funny bits such as when the two old guys, both professing to know exactly how the skit went, silently battle each other over furniture placement for rehearsal. The stage absolutely lights up when voluptuous Annie Abrams, the so-called doctor’s nurse, vamps up the scene. But none of this can save director Thea Sharrock’s slow pacing, the voluminous Ahmanson Theatre’s unsuitability for intimate drama, or — let’s face it — Simon’s own dedication to one-liners. “The Sunshine Boys” is the stuff of forgettable reruns. Not a classic of theater. Go if you want to see Danny DeVito give the material more than it probably deserves, and Judd Hirsch give it his all. It may have played well in London, but let this be the last remake. It is time for the sunset.